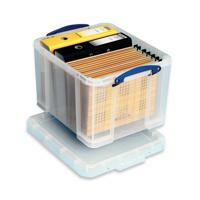 Save time and space with a Really Useful 35 litre storage box. Solid, strong and stackable with a lid that locks securely in to place, it comes as part of a fully interchangeable range. <br><br>A clear polypropylene container which lets you see easily what's stashed inside. 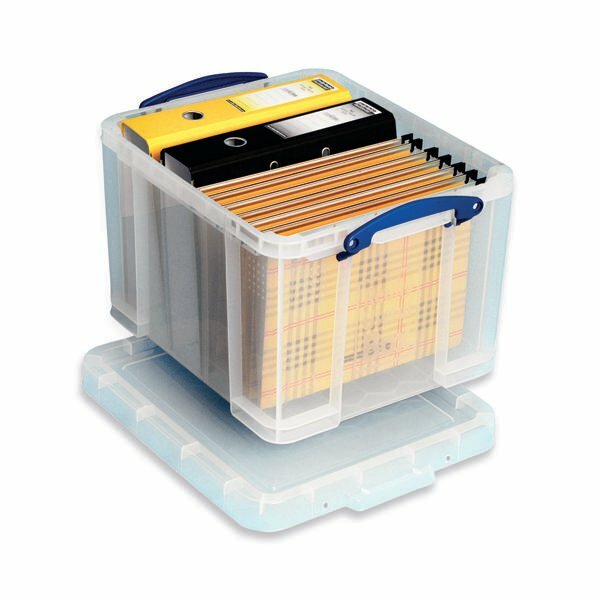 <br><br>Designed to be versatile, it is a great way to keep odds and ends neatly stored or could even serve as a low-cost filing solution. Made from 100% recyclable Polypropylene. Strong enough to support an adult's weight yet light enough to transport easily. Ideal for all office media including A4, foolscap, suspension and lever arch files. Integral lip allows suspension files to slide. Transparency allows for ease of contents identification. Positively stack for rigidity and a safe archiving space. No holes in carrying handles preventing dust, moisture and rodent entry. Box includes lid and locking handles.